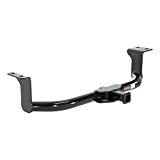 When buying a trailer hitch assembly the first thing you need to do is to identify which one is right for the job. If you are new to towing understanding the terminology, and the different types of hitches that are available is tricky. The purpose of this page is to help you to overcome that initial confusion. The flexibility that receiver hitches allow has meant they have grown in popularity. 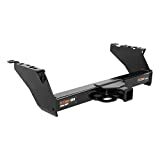 Like all hitches, they consist of a simple frame that is constructed in a way that allows it to be attached to the underside of the vehicle you are planning to tow with. Incorporated into the center point of the frame is a tube shaped receptacle. That receiver tube is there to allow a bar, with the coupler mechanism at the end of it, to be added to your vehicle. The majority of people who tow opt to use a tow ball as the coupler mechanism. But, there are other options available including pintles, clevis hitches, multi-function ball hitches and tri-ball mounts. In addition, you can also use the receiver tube to attach a cargo mount, or bike rack to the back of your vehicle. As you can see receiver hitches are extremely versatile, which is why they are so widely used. There are five classes of receiver hitch. Below we explain what you can tow with them, the type of towing vehicle each one can be used with. GWT – this means Gross Trailer Weight, which is how much the trailer weighs when fully laden. TW – this stands for Tongue Weight. This is the weight that is applied at the point where the trailer and hitch meet. OK, now that is out of the way we can get into the detail. TW – up to 1000LBs – when used with a weight distribution hitch that maximum weight rises to 1,400LBs. If you want to tow something heavy, a weight distribution hitch can help you to do so safely. These v-shaped hitches are designed to reduce the amount of weight that is applied to the point where the vehicle and trailer join up. They do so by spreading the weight more evenly, across the axles of the tow vehicle and your trailer or camper. 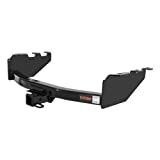 As the name suggests bumper hitches are mounted onto a vehicle’s bumper. What you can carry depends on how much weight the bumper is designed to hold. These hitches are used with cargo carriers, as a way to extend a vehicle’s luggage space. These are ideal for people that just want to haul something tiny and not a full-sized trailer. 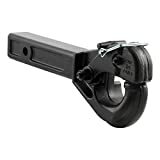 Front mounted hitches are very much a specialist product, for example, boat owners use them to launch their boats. They can be used for cargo carriers. In some parts of the world, 4×4 owners mount small plows on the front of their vehicle to help them to navigate snowy roads. 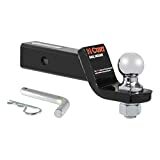 If you are towing a heavy RV of between 4.5t and 13.6t, a standard coupler, or weight distribution hitch, is not going to be stable enough to allow you to tow safely. In this situation, a gooseneck hitch can be a good alternative. 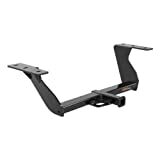 A gooseneck hitch is a ball mount, which is attached to the bed of a pickup truck, or a similar vehicle. 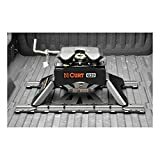 The fact that the tow bar is so far forward on the towing vehicle means that you can potentially tow a unit that weighs 20 to 25% more than you could if you were using a hitch that was mounted under the rear of the tow vehicle. Fifth wheel hitches are an alternative to a gooseneck. 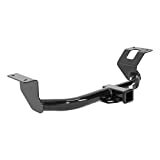 You can also mount this type of hitch assembly on the bed of a pickup truck. The device itself looks like a large horseshoe. It provides a strong and stable bond between your tow vehicle and heavy RV. You get less maneuverability than you would with a gooseneck, but you can tow more weight with a fifth wheel. At one time, a ball hitch was the only type available. 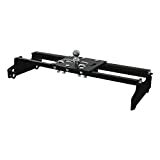 The tow ball is mounted on a plate, which is then bolted to the hitch frame that is attached to your towing vehicle. With this kind of hitch, you cannot change the towing coupler. This lack of versatility is why they are not popular. However, they are an extremely cheap way to add towing capability to practically any vehicle. How much you can tow using this type of hitch depends on the weight and power of the tow vehicle and its frame. If you have something heavy to tow a pintle hitch may be a good idea. Construction crews and farmers use them a lot. A standard pintle hitch consists of a hook like attachment that closes around a ring or lunette, which is attached to the trailer. They are noisy, but come into their own if you have to tow something heavy over rough ground because they flex up and down as well as side to side.